Hearing loss causes people suffering from it to miss out on so many sounds frequent in everyday life. Hearing loss causes people suffering from it to miss out on so many sounds frequent in everyday life. In this blog we will explore what those sounds are. Because hearing loss is such a prevalent issue in our society, this is a subject really worth investigating. Read on to learn more about the sounds that people with hearing loss miss out on. Conductive: Mostly associated with aging, conductive is where sounds cannot pass through the inner ear and reach the brain. Thus, they can’t be interpreted at all, correctly or not. Sensorineural: This type regards any damage to or defects of the inner ear or the auditory nerve. Causes of this type include congenital disorders, diseases, or some kind of trauma. Mixed: Mixed hearing loss occurs when both conductive and sensorineural are co-morbid. Auditory Disorder: When the inner ear itself is damaged, it hampers the brain’s ability to interpret any sounds at all. Sometimes, hearing loss is only at higher frequencies of sound. The threshold for the higher frequencies is at 2,000 hertz. This type of hearing loss makes understanding words much more difficult. Programs on TV or words heard during conversation will sound muted, distorted, or unclear. Words with the consonants such as S, H, and F typically fall in the range of 1,500 to 6,000 hertz, and thus are by far the most affected. Loss of hearing can also affect low frequencies as well. This sort of hearing loss involves the sensorineural type of hearing loss. Sounds lower than 2,000 hertz are affected at this range. Causes of this include genetic or congenital defects. Softer tones will need amplification, which is why hearing aids are so immensely useful as devices to help compensate for hearing loss. Background noise and any other ongoing sounds, such as conversation, in noisy settings can be distracting and upsetting. Normal, undamaged hair cells inside the inner ear will take over for damaged cells but cause excessive loudness. 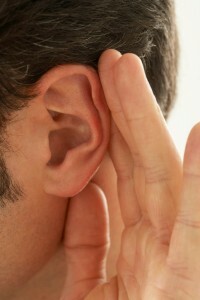 When hearing loss is severe enough, the listener cannot hear any speech at all. A hearing test can help determine how severe hearing loss is. This entry was posted on Friday, April 14th, 2017 at 9:52 am. Both comments and pings are currently closed.